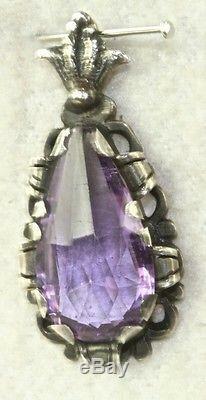 This item for sale is a 1930's or so, vintage, unmarked, sterling silver and natural amethyst pendant in excellent gently used condition. The piece weighs 3.1 grams, measures 1.25 inch tall and just over 1/2 inch across. The amethyst alone is 19.5mm by 10mm. In my honest opinion, it is Scandinavian in origin. A wonderful addition to your collection. Or whatever you are interested in seeing culled for you from the many pages of our fine and vintage jewelry listings. This item will be very well packaged in a cardboard box. Thank you very much for looking. The item "VINTAGE 1930'S SCANDINAVIAN STERLING SILVER AMETHYST PENDANT FOR A NECKLACE" is in sale since Wednesday, October 08, 2014. This item is in the category "Jewelry & Watches\Vintage & Antique Jewelry\Vintage Ethnic/Regional/Tribal\Scandinavian". The seller is "peepsnmeems" and is located in WE LOVE TO COMBINE SHIPPING FOR YOU!! !.